↑ Between 18.29° and 28.58° to Earth's equator. ↑ There are a number of near-Earth asteroids, including 3753 Cruithne, that are co-orbital with Earth: their orbits bring them close to Earth for periods of time but then alter in the long term (Morais et al, 2002). These are quasi-satellites – they are not moons as they do not orbit Earth. For more information, see Other moons of Earth. ↑ The range of angular size values given are based on simple scaling of the following values given in the fact sheet reference: at an Earth-equator to Moon-centre distance of 378 000 km, the angular size is 1896 arcseconds. The same fact sheet gives extreme Earth–Moon distances of 407 000 km and 357 000 km. For the maximum angular size, the minimum distance has to be corrected for Earth's equatorial radius of 6 378 km, giving 350 600 km. ↑ Lucey et al. (2006) give 107 particles cm−3 by day and 105 particles cm−3 by night. Along with equatorial surface temperatures of 390 K by day and 100 K by night, the ideal gas law yields the pressures given in the infobox (rounded to the nearest order of magnitude): 10−7 Pa by day and 10−10 Pa by night. ↑ ၁.၀ ၁.၁ ၁.၂ ၁.၃ ၁.၄ ၁.၅ ၁.၆ "The constitution and structure of the lunar interior" (2006). Reviews in Mineralogy and Geochemistry 60 (1): 221–364. doi:10.2138/rmg.2006.60.3. ↑ ၂.၀ ၂.၁ Lang, Kenneth R. (2011), The Cambridge Guide to the Solar System, 2nd ed., Cambridge University Press. ↑ Morais, M.H.M. (2002). "The Population of Near-Earth Asteroids in Coorbital Motion with the Earth". Icarus 160 (1): 1–9. doi:10.1006/icar.2002.6937. Bibcode: 2002Icar..160....1M. ↑ "Topography of the Moon from the Clementine lidar" (1 January 1997). Journal of Geophysical Research 102 (E1): 1601. doi:10.1029/96JE02940. Bibcode: 1997JGR...102.1591S. ↑ "Lunar moments, tides, orientation, and coordinate frames" (1996). Planetary and Space Science 44 (10): 1077–1080. doi:10.1016/0032-0633(95)00154-9. ISSN 00320633. Bibcode: 1996P&SS...44.1077W. ↑ "Celestial body irradiance determination from an underfilled satellite radiometer: application to albedo and thermal emission measurements of the Moon using CERES" (2008). Applied Optics 47 (27): 4981–93. doi:10.1364/AO.47.004981. PMID 18806861. Bibcode: 2008ApOpt..47.4981M. ↑ A.R. Vasavada, D.A. Paige, and S.E. Wood (1999). "Near-Surface Temperatures on Mercury and the Moon and the Stability of Polar Ice Deposits". Icarus 141 (2): 179–193. doi:10.1006/icar.1999.6175. Bibcode: 1999Icar..141..179V. ↑ "Understanding the lunar surface and space-Moon interactions" (2006). Reviews in Mineralogy and Geochemistry 60 (1): 83–219. doi:10.2138/rmg.2006.60.2. ↑ Scott, Elaine. 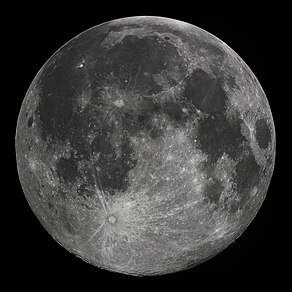 Our Moon: New Discoveries About Earth's Closest Companion. Houghton Mifflin Harcourt (2016) ISBN 9780544750586. page 7.